My mother always had her head in her art. One of my earliest recollections growing up was her gluing tiny glass stones into mosaics of colorful peacocks. Then she shifted to ceramics and for years our cars could not park in the garage because of her kiln and workshop. When I sang in a choir called Na Kani Pela we needed to raise money so we could represent Hawaii for the Bicentennial. She conducted a group of moms who worked to make centerpieces of town criers from the 1700’s for our banquet. She was always up to her elbows in art projects. When my dad died she took up painting and during this time entered what I consider her most confident and creative period. I have paintings hanging in my home of a rabbi, of Japanese carp called koi, and of Parisian street scenes like you might see on Montmartre. She put her art away for a time when she remarried and spent years dancing the tango. I am a tanguera she once told me. For a time music took the place of paint and canvas. Now she is back at it with fancy figurines and fans and masks. Her art is full of fantasy and whimsy and old Hawaiiana. My favorite piece is an oil painting called Paniolo Country. 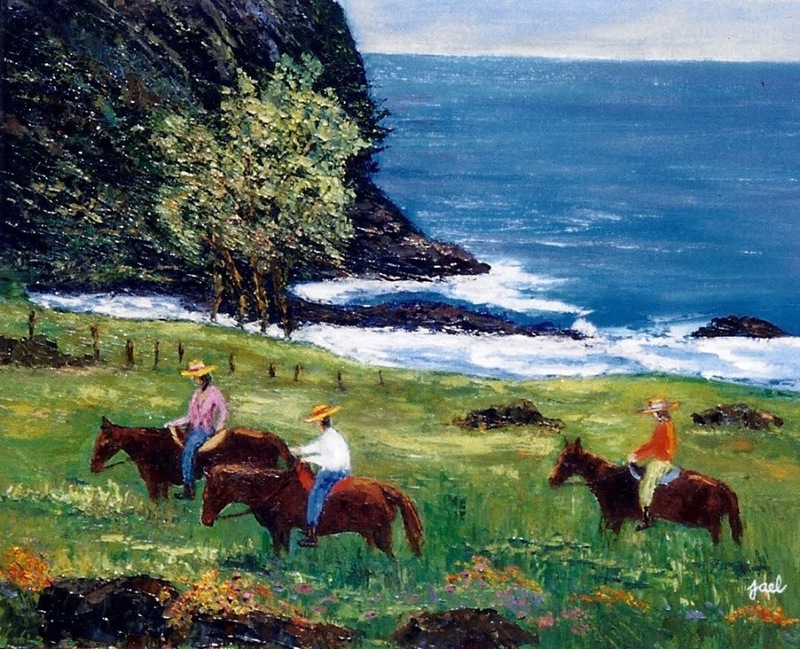 I love cowboys and Hawaii and asked my mom how this painting came to be. I am curious what catches her eye. Years ago Dad and I flew to Molokai, Kalaupapa, which was the leper colony, with Bob Benson in his private little plane from Frito Lay. He asked us to join him for the day and he would get a special pass because they were getting ready to do away with the leper colony and turn it into a museum. As frightened as I was of flying, and especially in a small plane, we joined him with his wife Beth for that once in a lifetime opportunity. What I saw from the top of the cliffs was what the painting depicts. I remember thinking, wow, what a view! I thought this was the best view in the world and the poor people there cannot fully enjoy it. I did not paint this painting till after Dad died. It was when I saw one day in a magazine something similar and it reminded me of what I saw in Kalaupapa looking down. They used to throw the lepers down the cliffs into the ocean before Father Damien came. You could only reach the top at one time on horseback to bring supplies. There was no other way except a very narrow trail for horses and mules. Paniolo Country is just one of many paintings and unique pieces you might enjoy at Art by Jael. Her inspiration comes from the scenery of Hawaii and the imagery of her own imagination. Perhaps you will find yourself a treasure. To see photography by Vicky Collins visit Vicky Collins Photography. Categories: Aging, Arts and Culture, Business, Children, Economy, Hawaii, Inspiration, Judaism, Media, Midlife, Music, News, News and Views, Parenting, Random Thoughts, South America, Travel, United States of America, Women | Tags: Art, Art by Jael, Bicentennial, Carp, Ceramics, Father Damien, Hawaii, Hawaiiana, Jael Collins Blazquez, Japan, Kalaupapa, Koi, Molokai, Montmartre, Na Kani Pela, Painting, Paniolo Country, Paris, Tango | Permalink. I guess it was inevitable. Andy in “Toy Story” would grow up just like little Jackie Paper in “Puff, The Magic Dragon.” To this day I cry when I hear Peter, Paul and Mary sing the song so I wasn’t surprised that I got sentimental when I saw “Toy Story 3” last night. What I wasn’t prepared for was the complete welling of emotion. I had been warned by a friend on Facebook that this was a tearjerker but I didn’t see it coming through Woody’s antics and Buzz Lightyear’s Spanish speaking tango romp. Then I became a blubbering mess. My 12 year old said I was crying louder than anyone else in the theatre. You see, in two years I’ll have my own kid heading off to college and I’m already filling with nostalgia. My baby, the one who was photographed in his diapers and cowboy boots, the one who poured flour all over himself, who cried in the closet when he missed the ball that could have won the game, then years later played on the team that won the championship, will head to college too. And like Andy’s mom in “Toy Story 3” I’m not prepared to let him go and be left standing alone in a cleared out room. This sophomore year has been a difficult one and there have been many times I’ve wished he would grow up, but when I actually stop to consider it, like I did last night, I realize how I’m dreading this rite of passage. It occurs to me that it probably hit my parents like a load of bricks too. I was the only one in our family to go to college. My dad only completed 8th grade, my mother dropped out of nursing school to get married, and my sisters chose not to go. My father was immensely proud to have a college student but I know when he wrote the check that guaranteed my spot at the University of Colorado he had a difficult time signing his name. Everything he dreamed of and dreaded would come to pass with the misty eyed stroke of a pen. My mom took it hard too when she brought me to Boulder and I couldn’t wait to run out with my new found friends. 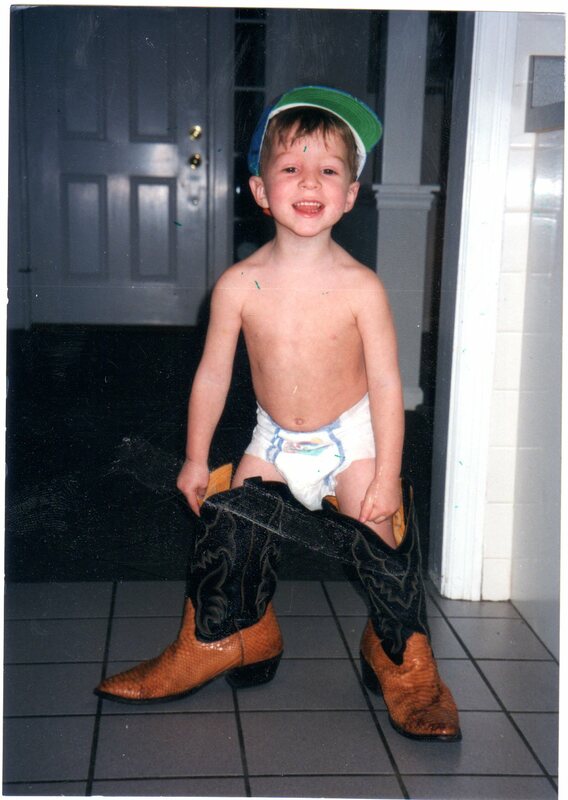 Now as my son hurtles towards adulthood (he’s 16, has a license, a truck and his first job) and passes through the house for food and showers, I can’t help but wish I had hung on to his playthings. I wish I hadn’t been in such a rush to send them to Goodwill. They’re gone, and soon he will be too, and I’ll be missing him in a room without toys and my boy. Categories: Aging, Children, Colorado, Education, Facebook, Inspiration, Media, Midlife, Movies, News, News and Views, Parenting, Random Thoughts, Sports, Women | Tags: Boulder, Buzz Lightyear, College, Colorado, Facebook, Goodwill, Kyle Ewalt, Peter Paul and Mary, Puff the Magic Dragon, Spanish, Tango, Toy Story 3, University of Colorado, Woody | Permalink.